Precision dispensing systems provide safe and leak free fluid application from syringe barrels, cartridges, pressure pots, bottles, valves and pens. Industrial grade safe products for applying most adhesives, pastes, epoxies and assembly fluids. Used manually, with a pneumatic benchtop dispensing system, assembly line valve or XYZ robot system. Adhesive Dispensing Limited provide dispensing products for the controlled application of most adhesives, sealants, lubricants, pastes and many other assembly fluids. Systems that eliminate material waste, improve process control and eliminate operator hand fatigue. Simple solutions to dispensing processes from low volume applications, prototype assembly, field work, automated production cells or high volume assembly lines. We hold in stock hundreds of thousands of components, spares and consumables for fast delivery around the world. Our customers benefit from cost effective and reliable CE approved dispensing systems, high quality industrial grade and silicone free components and high levels of ongoing technical and service support. We are an ISO9001:2015 accredited company. Our fluid and paste application systems range from basic portable hand dispensers to timed-shot bench top air-powered syringe dispensers, assembly line metering valves and XYZ robots. We can also pack your specified sealants, silicones, RTVs, epoxies, inks, adhesives, gels, greases and pastes pre-filled air-free in a syringe barrels or cartridge component including premixed and frozen dual component epoxies. Component syringe barrels, needle tips and cartridge reservoirs are industrial grade safe for use under pressures in most assembly and production environments. Components are certified silicone free and compatible with all major dispensing systems available today. Samples of dispensing components are available on request. We can arrange for a UK sales engineer to visit your site with product samples and provide an equipment demonstration. Components Syringe barrel and cartridge components, needle tips, nozzles, fluid lines, pinch tubes, caps. Use with adhesive dispensers and guns. Dual component cartridges up to 400ml. Also, bottles with luer caps for manual applications. Also available are mixer nozzles, speciality type nozzles and fittings. Syringe Guns Hand operated manual SyringeGun for medium to high viscosity pastes, gels, sealants, RTV, grease and epoxies. Simple to use for dots, beads or field applications. High density plastics. 7:1 ratio hand leverage eliminates hand fatigue. Dispense action prevents drips. Low cost dispensing solutions. 10cc, 30cc and 55cc sizes. Cartridge Guns Heavy duty industrial cartridge guns for sizes 30cc/ml to 950cc. Manual operated, air-powered or electric. Guns for all industry standard type cartridges, mixer cartridges and Techkit cartridges. Guns are ideal for controlled lines or potting of medium to high viscosity pastes, gels, sealants, RTV, grease and epoxies. 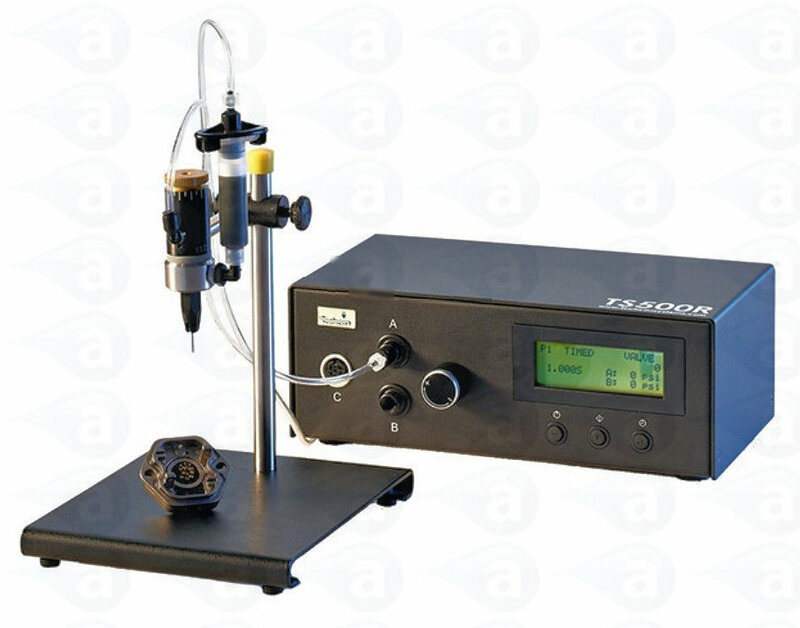 Air Dispensers Dispensers available for applying repeat dots, controlled lines or potting with most materials including pastes, gels, RTV, sealants, PVA, UV cure, cyanoacrylate, epoxy, anaerobic, solvents, chemicals and solders. Manual, timed or digital memory, types. All dispensers use syringe barrels or cartridges. XYZ Robots Bench top XYZ robot systems in sizes from 200mm x 200mm to 600mm x 600mm. Easy programming for dots, lines, arcs, circles and potting. Available in 3 and 4 axis. Robots for applying fast deposits of most adhesives and assembly fluids. 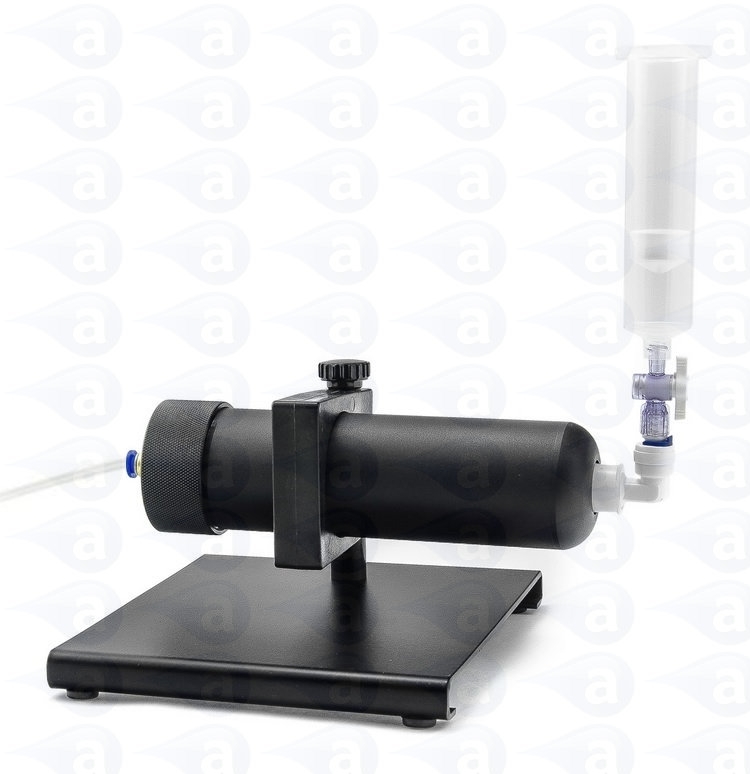 Can be supplied with syringe mount, valve head, hot melt system or meter mix valves. Metering Valves High precision metering valves for most single part fluids. Ideal for bench stand mounting, production line or XYZ robot. Special valves for spraying, valves for CAs, UV adhesives as well as positive displacement motor driven valves. 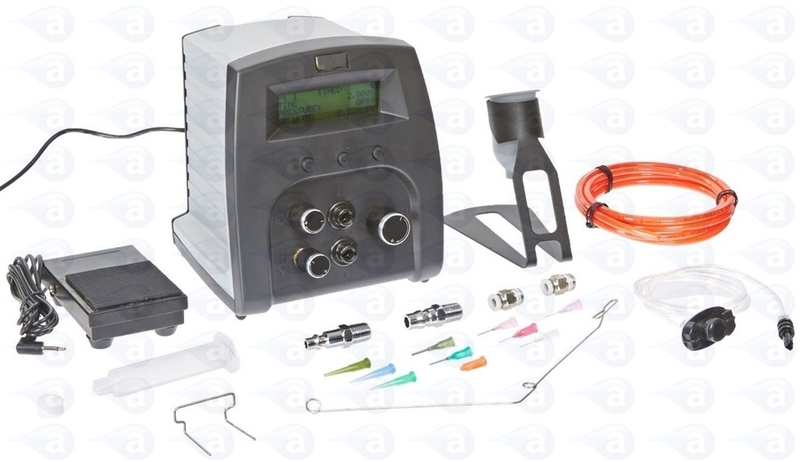 Also available are compact digital timed valve controllers, pressure pots & stands. Fume Extraction Fume extraction systems for the safe working environment when handling adhesives, glues, aerosols, soldering systems and solvents. Removal of fumes, vapours, mists, particles and dust to the Control of Hazardous to Health (COSHH) regulations 2002 and 2004. Recirculatory and full exhaust air filter and extraction for all applications. Syringe Fillers A range of syringe filling systems for the clean and quick transfer of adhesives, sealants, silicones and other materials from cartridges into any size syringe barrel. Material is fed under pressure to bottom fill the syringe to eliminate mess, waste and air entrapment. Simple to use systems supplied with a range of components and fittings. Accessories Useful additions and accessories for your guns, dispensers, valves and robots. Bench stands, finger switches, air filters and liquid manifolds. We supply an extensive range of products to support your existing dispensers or valves. Please contact us if you are looking for a particular part that you cannot find on our website. Packaging Receive your specified adhesive, epoxy or assembly fluid pre-packaged in syringes, cartridges, Techkits or pre-mixed and frozen. Save time spent manually filling syringes or hand weighing then mixing epoxies. Air free filled components improve dispensing applications and reduce costs. Please contact us for options. Spring Nib Pens Aluminium or plastic bodied dispensing pens with felt nib and cap seal. For applying inks, coatings, adhesives, solvents, primers, coatings and activators. Supplied unassembled ready for filling with you specified liquid. Also available prefilled with your own specified materials if required. Ideal for UV primers, liquid fluxes, inks and solvents. Adhesives A range of industrial strength Cyanoacrylate instant adhesives in 50g and 500g bottles. High quality for bonding plastics, metals, rubbers, card and paper. And a range of threadlockers, screw lock and gasket materials. Epoxy resins and UV cure adhesives. Caravan repair and doming resins. All adhesives are industrial grade and UK blended. Prices are in UK GBP pounds. Vat is not charged on orders placed outside the EU and any EU orders are exempt from VAT only if a valid company VAT number is provided to us at time of order or before shipping. Products are covered by a 12-month warranty against faults and malfunction. All orders online are encrypted for safety and security. Please read our privacy agreement for details. We also process phone or fax payments by credit and debit card. Please contact our accounts department if you would like to open a credit account with us. Disclaimer: While reasonable efforts have been made to ensure all information on this website is accurate, Adhesive Dispensing Ltd. do not assume responsibility for any errors or omissions. All specifications, illustrations, data and prices are subject to change without notice. Products are industrial grade.